Element Meaisam is situated in Dubai Production City, in close proximity to Dubai Sports City and City Centre Meaisam. The property is a part of Marriott Internationals newest hotel complex in Dubai which also features the recently opened Aloft Meaisam. 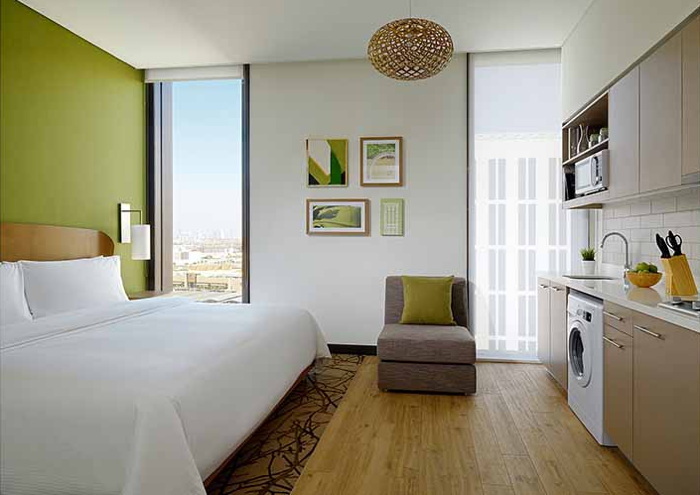 Marriott International today announced the debut of Element Hotels in the Middle East and Africa with the opening of Element Me'aisam in Dubai (United Arab Emirates). Owned and developed by Dubai Properties, Element Me'aisam presents a fresh, appealing concept for short and long stays in the city with its eco-conscious ethos and innovative programming. "A recognized industry leader in the eco-space, Element promotes a life in balance with its emphasis on wellness and sustainability and we are excited to debut the brand in a city like Dubai where sustainability remains a key focus across all sectors," said Alex Kyriakidis, President and Managing Director, Middle East and Africa, Marriott International. "With the debut of Element, the United Arab Emirates is now home to 16 of our brands across more than 50 hotels." Certified as a LEED related building, Element Me'aisam was built green from the ground up and adopts natural light, open spaces and healthier lifestyle options. The property features 168 light-filled studios and one-bedroom suites with a fluid design, fully-equipped kitchens, spa-inspired bathrooms and signature Heavenly® Beds. Rooms at Element Me'aisam are equipped with SPG Keyless, the industry's first truly mobile check-in system where guests can utilise their mobile phones as room keys. The hotel offers a variety of innovative amenities and services that allow guests to maintain a healthy and balanced lifestyle while on the road including an outdoor pool, the Motion Fitness Center and a complimentary Bikes to Borrow program with new brand bike partner Priority Bicycles – the first Element property outside the U.S. to feature Priority Bicycles. The Rise breakfast at the hotel features a variety of healthy and fresh options like juices and breakfast wraps. Guests can also wind down at the end of the day and enjoy complimentary appetizers and beverages during the Relax evening reception. Electric vehicle charging stations are also available at the hotel. "Element brings a new experience to the hotel landscape in the region by catering to the eco-conscious, longer stay guest looking to maintain a balanced lifestyle while they travel," said Stuart Birkwood, General Manager. "We look forward to bringing the Element brand to life not only from a product and design perspective but through our innovative programming and service throughout the property." Element Me'aisam is situated in Dubai Production City, in close proximity to Dubai Sports City and City Centre Me'aisam. The property is a part of Marriott International's newest hotel complex in Dubai which also features the recently opened Aloft Me'aisam.